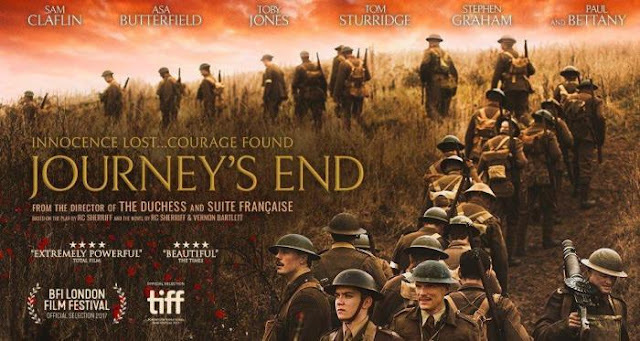 Journey's End is in theaters April 13th, 2018. 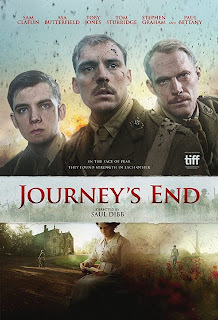 In Dibb’s Journey’s End, the audience is dragged down into the trenches alongside a dedicated cast in this gripping, World War I film. Set in 1918, the story follows one company of British soldiers fulfilling a 6 day rotation at the front lines of a stalemate in Amiens, France. Rumors that slithered through the trenches of an impending German attack had the rotation played as more of horrific game of hot potato. The soldiers are led by Captain Stanhope (Sam Claflin) and his second, “Uncle” Osborne (Paul Bettany). It is intriguing enough to simply observe the lighting of incessant matches and conversations over poorly supplied meals preparing for war, but with the introduction of the naive newcomer, Second Lieutenant Raleigh (Asa Butterfield), comes the ever growing feeling of impending doom. Raleigh utilizes old fashioned nepotism with his general ranking uncle to be apart of Stanhope’s company because they had once been acquainted and he simply looked up to the now poorly strung together leader. It is a gamble for the men until orders pass that require the men to dash across no man’s land. The viewer can easily slip into the minds of the soldiers, giving proper weight to the 6 day Russian roulette that they had to brave in the trenches. The stylistic choices of filming brought the gritty, claustrophobia-inducing setting to the audience. Dibb and Reade do a brilliant job balancing the often unbelievable closeness that we find from war stories compared to the devastating toll of war. From transitional dialogue to the timely text etching the death toll, perspective was not something overlooked despite the lack of exploration outside of the front lines. There was a deliberate choice not to branch out from the film’s preceding play in this adaptation, which may bore some viewers that need the sets to change in order to resist the urge to pick up their phone, but to me it made the film so raw and hurtful that you can only imagine other stories like R.C. Sherriff’s that could be told from the other souls that did not survive.